What We See. And What We Don’t. 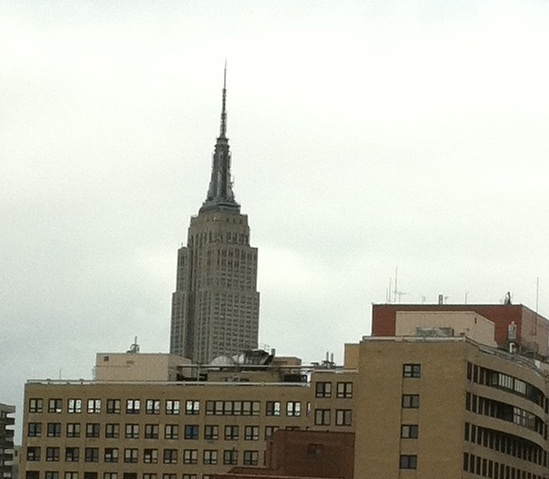 Outside our window is one of my favorite sights–the Empire State Building. For obvious reasons (like, I love this city, and I am so grateful for once to not be facing a brick wall in Manhattan), this makes me very happy. On rainy, humid summer days, the view is transformed. Fog covers most of the city so that the skyline seems to have disappeared overnight. I wake up early to close the windows to the rain and it is a different city. The Empire State Building is gone from sight these mornings. This is what we see. 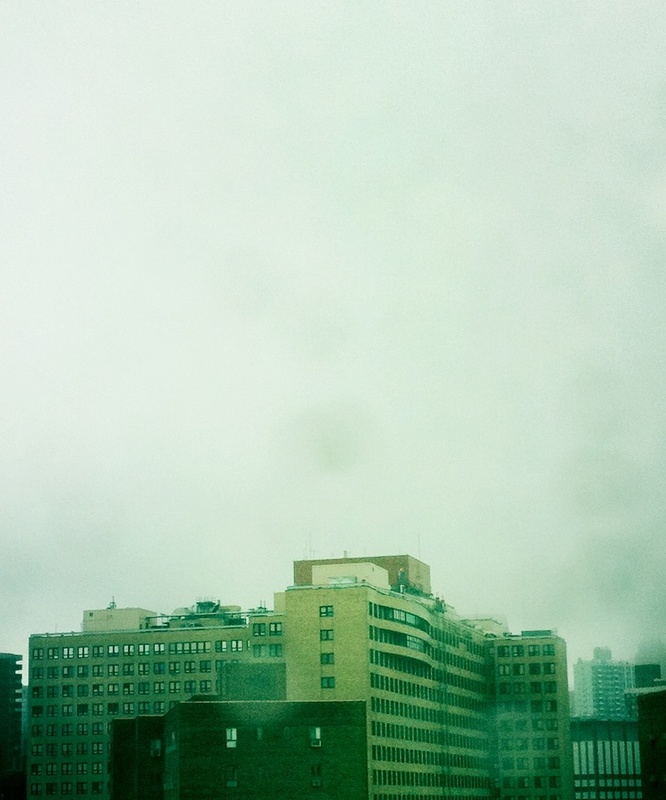 We are used to this–the infamous New York landmark disappears on foggy days. The mist obscures everything across the river as well. We feel isolated and alone when we are, in fact, surrounded by buildings. Not unusual, always jarring, it has been making me think about not seeing what is in front of us (I’m being both figurative and literal here. Watch out yo.). How does an 80-year-old skyscraper disappear for hours on a rainy morning? What do we say of a city haunted both by the invisible and the invincible? 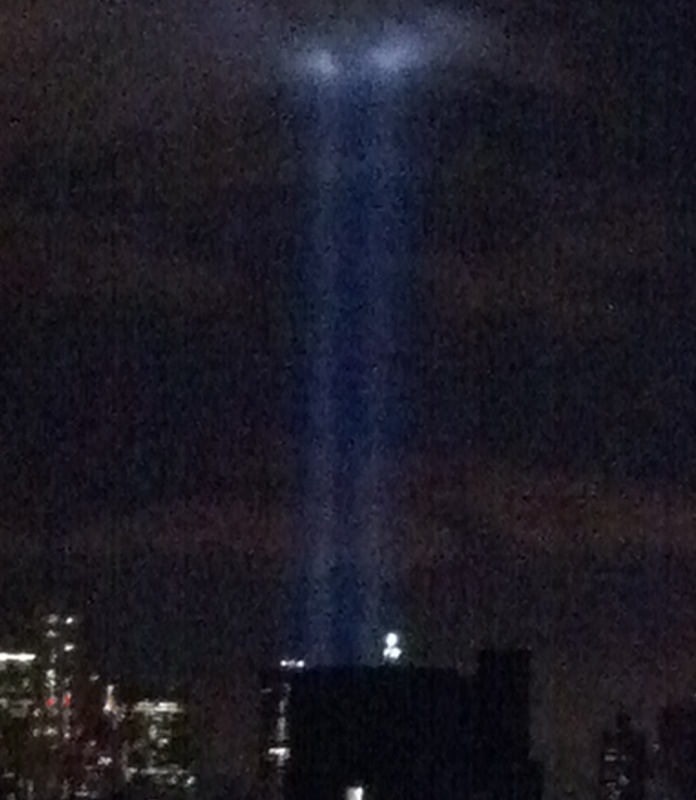 The lights burn into the September sky. Breathtaking and ethereal, they are a reminder for what cannot be forgotten–the gaping hole in the New York skyline, the raging rip through our history and heart. I am not qualified to make this post a tribute. There is nothing profound that I could add to the discussion of what Manhattan was like on that day almost 10 years ago, and what it has been like here since. I wanted to leave after September 11, 2001. I worked downtown and I was desperate to be anywhere but there. I was terrified and broken and shaken to my bones. We stayed for various reasons (jobs, apartments, inertia) and then left six years later when our first child was born (for space, for money, you know the drill). By then, of course, I didn’t want to leave. Not one bit. For weeks before we moved, I stayed awake into the night (pregnant insomnia, thank you) and wished I would never be robbed of the beautifully lit scenes outside our living room window facing north from 35th Street: The Chrysler Building, The MetLife Building, the rooftop water towers, the roof gardens. I am no one special here. Yet, I am as unique as all New Yorkers. Our stories are heartwarming, horrifying, inspiring and boring. We, like our city, are contradictions. New York is not a perfect place. Here, in the city that drives the world’s economy, where billions of dollars are made in hundreds of industries, where art and fashion become “Art” and “Fashion,” there are people living on the street. We walk over and around them. There is no way to make sense of this. (I don’t accept capitalism as an explanation. There is no moral sense to this.) There are invisible people here–here in the smartest, brightest, most dazzling city in the world. And they will never be seen. The Veterans Affairs Medical Center is visible as well outside our apartment window. Despite our being at war for the past ten years, those who are serving and have served our country aren’t first to be exalted in our collective mind. We are grateful and sad of course, but we don’t laud our troops the way we do celebrities. Or reality tv stars. I watch people entering the building downtown and wonder who they are. We don’t recognize them. They too, seem to exist outside of sharp focus. As summer closes, I am thinking of two truths. Each is disturbing, comforting, complicated. There is that which we do not or will not or can not see regardless of how long it is in front of us; there are those places and people no longer with us who burn always in our minds. 11 Responses to What We See. And What We Don’t. This is beautiful. Thank you for recognizing the military. Although most do it despite the lack of recognition, which is what makes it the greatest sacrifice of all. indeed. it is impossible to pay tribute adequately. I can only say I think of our troops often. I think of their families. Good one babes… Milo was just talking about being invisible yesterday. What a big concept you so beautifully illustrated. This IS a tribute and a wonderful one. It’s amazing me that the 10 year anniversary is upon us. Thank you Missy! I appreciate that. this is beautiful. i was talking to my husband today about how we seem to forget the role our military play in this. they deserve recognition on this day. 9/11 changed their lives too. it did–for so many military families. it’s overwhelming to think of. This is one of the reasons the “Cleaning for heroes” was created. My cleaning company “KeepYourHomeClean.com is a part of it. We clean for free. Check their web site http://www.cleaningforheroes.org/. Great view by the way.